Casa Estrella de Bacalar designed by renowned architect, Ricardo Romay, a dream realized. Overlooking a small, private cove on the shore of Laguna Bacalar, this gem of a house has all of the artistic features that define each space, designed to provide maximum appreciation of the magical laguna, with privacy, tranquility and comfort. From the long driveway through hardwood trees and coconut palms, to the entryway into the charming, spacious courtyard with its lovely landscaping and the fish pond at the entry door, there is an immediate appreciation of what has been created. Once inside, there is a stunning view of the magnificent blue-green waters of Laguna Bacalar which can be seen from the entry, the dining area, the master bedroom and the living room, all of which face onto the water. The central part of the house has a kitchen with beautiful hand-made louver cabinets, a wood and bamboo bar, and dining area which also opens to the terrace overlooking the laguna. All the magnificent woodwork in the house is made of native hardwoods, mahogany, cedar and others. Large, comfortable hammocks are strung on the terrace in front of the master bedroom and living room, with the space in the middle for outdoor dining. The spacious master bedroom suite features an amazing mosaic diptych by noted Mexican sculptor, Gilberto Silva, occupying the main wall, and an open area for reading, writing or painting. One need not be in a hurry to get out of bed in the morning for a view of the laguna which is just outside, past sliding glass doors leading to the terrace which fronts the house. The ample and artistic bathroom has been carefully designed as a really special space, which features a hand-made round tub with mosaic floor and over-head shower, surrounded by a lush indoor garden. A large vanity and floating sink are adjacent to the garden and the whole room is filled with art-work, candles, and flowers. Overhead skylight and high windows bathe the room in light, bringing the beauty of the outdoors inside. The other wing features a small, intimate beamed ceiling living room with built-in sofas adorned with piles of colorful Guatemalan fabric throw pillows. A TV and DVD player is provided for movie watching when desired. The room opens, by sliding glass doors, on to the large terrace running the entire width of the house, facing the laguna. Separating the living room from the studio guest room and bathroom is a half-wall with louvres that can be closed for privacy during the night or left open for the view during the day. A fantastic house and property! We had an absolutely fantastic experience during our weekend getaway in Bacalar. Living in Puerto Morelos, we are no strangers to the beauty and charm of Riviera Maya. That being said, Bacalar, and Casa Estrella hold a unique charm. 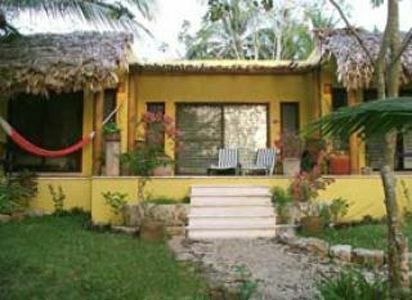 The house and property are perfect for two couples or a small family. The lay out is exceptional, fully stocked amenity wise, and the grounds are spacious and quiet. Access to the eco resort next door is a real plus. All four members or our group give huge thumbs up and will surely return to this amazing place. Everywhere I looked, I saw something beautiful! After checking in with the Rancho Encantado Resort front desk to easily obtain my key, my group arrived into a beautiful walled and gated, night time tropical garden blooming with flowers. Upon entry to the main house, I was enchanted by the soft light, cleanliness and flowers accenting the incredibly lovely rooms. A thoughtful art collection reflecting the owner's love for Mexico met my eye no matter where I turned. I had found the tranquility and beauty that I was seeking to create for myself during my time at Laguna Bacalar. This house is perfect for one, two couples or a small family group of 4 with children over 12 years old. The master bedroom is a romantic dream with comfortable king bed and huge tiled bathtub that can easily accommodate two. The water view is stunning. The second bedroom was as beautiful and cozy as well. The kitchen is fully equipped however I enjoyed the restaurant located within the resort for meal service. I adapted well and quickly to resort living with easy access to great food and all resort services by purchasing an inexpensive day pass to enjoy the pool, jacuzzi, boat, kayak and paddle board rentals. The majority of the time was spent relaxing on the waterfront patio in a hammock admiring the beautiful flowers and listing to the parrots chatter over my head. The respite from my hectic daily life was appreciated more than I can say. Thank you, Casa Estrella! I will dream of my return to your amazing home.